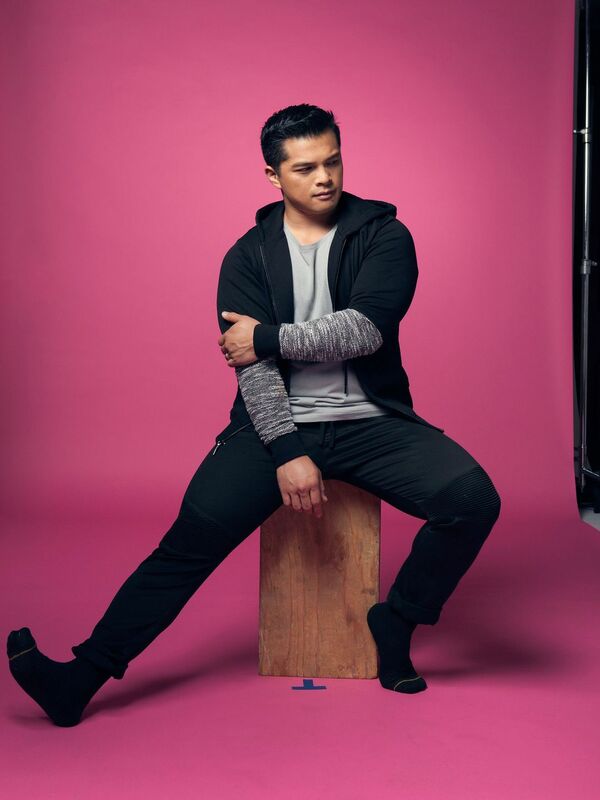 “When I got here I was having all these feelings,” Vincent Rodriguez III says as he steps out of Broadway Dance Center, where he dropped in for a beginners’ hip-hop dance class, where it was recommended you have three to five years of dance experience. It’s a Friday afternoon, and Rodriguez is visiting his old haunts in Hell’s Kitchen, where he spent years “pounding the pavement” as a working actor. When he moved to New York in 2004, he lived in Astoria, but Hell’s Kitchen was the epicenter of his life: He could go to rehearsals and auditions over on Seventh Avenue, and then hang out on Ninth Avenue, doing the occasional “survival job” – restaurant host, barista, personal assistant, Ikea furniture builder – in between gigs. He even got a personal mailbox on Eighth Avenue so he could better centralize his life. “New York reminds me of what my career was like when I lived here, so when I walk through the streets, I remember when I had ten bucks in my pocket and all I could eat is Chipotle,” he says, as he guides us left on Ninth Avenue. “Trying to thrive in this city trained me in my career, and in my life.” Where are we going, I ask? Chipotle, of course. Rodriguez left, as so many actors must, for Los Angeles during the summer of 2015, after booking his biggest role to date: Josh Chan, the object of Rebecca Bunch’s manic affection in the CW’s genre-expanding musical comedy, ｢Crazy Ex-Girlfriend｣. When he auditioned, Rodriguez was in the ensemble of ｢Here Lies Love｣, a “disco poperetta” about the rise and fall of the Ferdinand Marcos administration at the Public Theater in New York. He was a partial swing member – that is, someone who would shift into a number of ensemble roles and also understudied other parts in case someone got sick. It’s the type of role Rodriguez was used to: He’d spent his 20s as part of countless ensembles for regional productions, including ｢The Hunchback Of Notre Dame｣, ｢Pippin｣, ｢Xanadu｣, and ｢Irving Berlin’s White Christmas｣. “I definitely have had my down times and also have had my times of being very, very unemployed,” Rodriguez tells me in line at the Chipotle. The 34-year-old actor has a seemingly indefatigable well of positive energy to draw from, a quality he sees as crucial to surviving in the industry. “And by that I mean I’m just months without an audition or a callback and feeling like the business doesn’t want me anymore.” When it’s his turn, he orders his “default”: a burrito bowl with chicken and brown rice, some chips, and a bottle of apple juice – a splurge. “Many times you have to sacrifice the paycheck for doing what you love,” he adds. Josh Chan himself, particularly the nostalgia-drenched one of Rebecca’s summer-camp memories, was based off a friend he grew up with back in Daly City, a stronghold for the Filipino-American community outside San Francisco. He’s a familiar type to anyone from that world: the laid-back, slightly stoner-ish Asian-American dude who has a reflexive chill emanating from his bones. He isn’t very much like Rodriguez himself, who is more of a musical-theater ham, eager to break out in song and dance. And unlike Chan, he can actually assemble furniture. What better way to celebrate your one year wedding anniversary than going to Disneyland for the weekend?! Plus, we had to go back to the exact place I proposed to him, on Disney's California Screamin' ride. Love you babe! For now, that means keeping up with ｢Crazy Ex-Girlfriend｣, which has been picked up for a third season. “I feel like a kid in a candy store right now because every time I go to work, I’m always learning something new,” he says. Rodriguez is most comfortable with musical-theater dance, but throughout his run on the show, he’s had to do martial-arts send-ups and boy-band stylings. And Rodriguez is nothing if not determined. During the dance class earlier that day, he wanted to take a hip-hop class because it would throw him out of his comfort zone. For two hours, he learned a routine choreographed to Ludacris’s verse in Snoop Dogg’s ｢You Got What I Want｣. Rodriguez had a knack for picking up moves and throwing his body into the dance step with enough conviction that, even if he didn’t quite know the move at the beginning, he got it in the end.